Provide customers with better service than they’ll find anywhere, any time. Well, some things never change. We’re still family owned & operated. We still provide the bend-over-backwards, roll-up- your-sleeves kind of service. Only difference is, now we do it better than ever before. 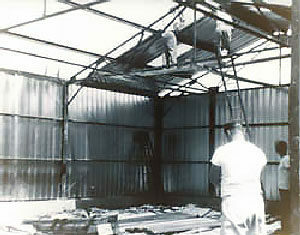 The Corken Steel Products Company was founded in 1955 as a wholesale distributor of metal roofing and rain-carrying products and building products. During the following years, the company expanded into heating and air conditioning equipment and all related products. Today, the company is comprised of three separate divisions – Heating and Air Conditioning, Roofing and Sheet Metal Fabrication – operating out of fifteen facilities including the distribution center which opened in November 2005, and the newest branch opening in Centerville, OH, in March 2018. This expanded family of divisions is an organization comprised of many people with different skills and talents. Each has an important part to play in the overall operation of business, and each has a responsibility to help the company fulfill its mission. Distributing high quality products to the market place while providing exceptional customer service in all areas of our business activities. Making itself known to all users and potential users of the products it distributes in order to ensure continued profitable growth and a strong position in the marketplace. Counseling and supporting our customers with programs and services that will enable the customers to manage and grow successful companies. Developing and cultivating partnerships with our customers that are based on the idea that our objective is the success of the customers business and that our commitment is to use all of our resources to help achieve that success. Upholding honest, courteous, fair and respectful principles when dealing with customers, suppliers and employees.